Unemployment Rate Steady As Economy Adds 215,000 Jobs : The Two-Way The July numbers were roughly in line with economists' expectations, and likely were strong enough to keep the Federal Reserve on track to raise interest rates. 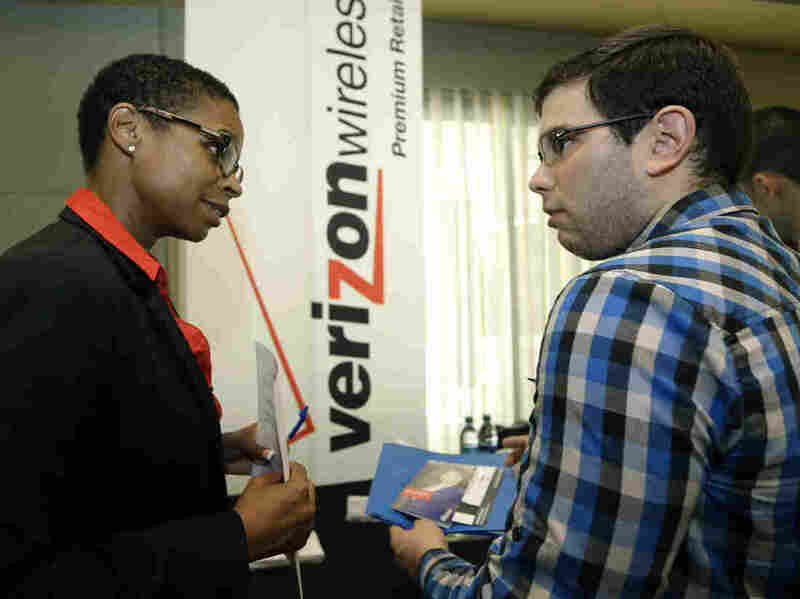 Sasha Vitalis (left) talks to job seeker Omar Delgado about employment opportunities during a job fair last month in Miami Lakes, Fla. The U.S. economy added 215,000 jobs last month, just shy of the number forecast by economists. The unemployment rate remained unchanged at 5.3 percent. Wages were up slightly, and the number of long-term unemployed remained the same as June. The consensus forecast had been for 220,000 new jobs. The gains occurred in retail trade, health care, professional and technical services, and financial activities, the Department of Labor's Bureau of Labor Statistics reported in its latest employment survey. For June, the Labor Department announced 223,000 jobs added, a figure that was revised upward to 231,000 in the latest report. The unemployment rate declined slightly, to 5.3 percent in that month. Jason Furman, the head of the White House Council of Economic Advisers, said in a statement: "Over the past two years, our economy created 5.7 million jobs, the strongest two-year job growth since 2000. And our businesses have created 13.0 million jobs over the past 65 straight months, extending the longest streak on record. But despite the rapid pace of recent growth, some slack left over from the financial crisis remains in our labor market, and there is more work to do to ensure that we continue to make progress." As The Washington Post notes, the report provides "a critical piece of information for the Federal Reserve as it considers whether the economy can withstand an increase in its benchmark interest rate. The nation's central bank generally raises its target rate when it is trying to rein in an overheating economy and lowers it when it wants to stimulate activity." NPR's John Ydstie adds: "Fed policymakers said last week that they wanted to see some further improvement in the job market before they raise rates." John said before the survey came out that hitting the expected 220,000 new jobs was "probably enough to keep the Fed on track to raise short term rates in September, off of zero where they've been for more than 6.5 years." The average hourly wage increased by 5 cents an hour, to $24.99. Over the past year, the hourly wage has risen by 2.1 percent. The average workweek for private, nonfarm payrolls also edged up slightly, to 34.6 hours in July from 34.5 hours in June. Some 29,000 jobs were added in food services, 28,000 jobs in health care, 27,000 in professional and technical services, 15,000 in manufacturing and 14,000 in transportation. The mining sector lost 5,000 jobs.